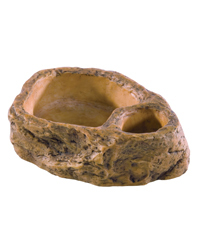 The Exo Terra Gecko Dish is a convenient 2-in-1 water and food dish. The smaller compartment is ideal for gecko food, nectar, mashed fruit, vitamin and mineral supplements, etc. The larger compartment is a water dish, with built-in safety steps to help prevent smaller geckos or feeding insects from drowning. "Hi, just to say thank you for the prompt delivery of my goods ordered on Tuesday all arrived in perfect condition."